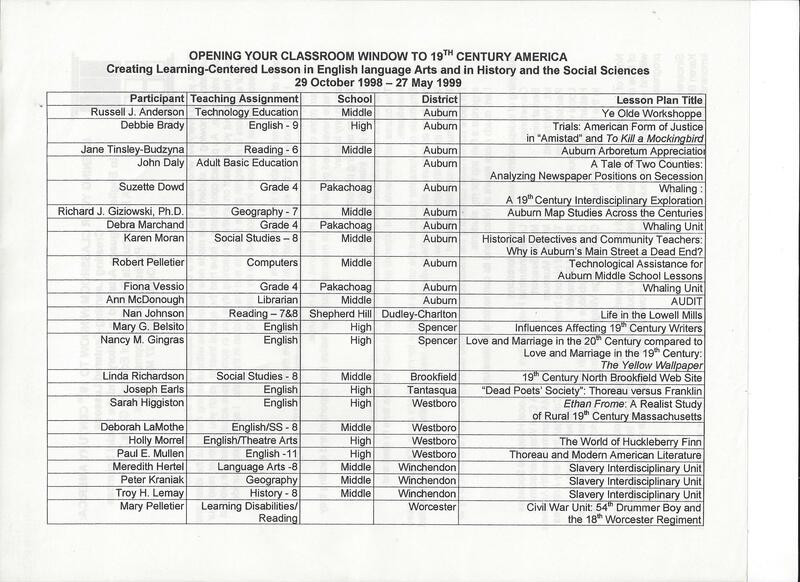 Between 1994 and 2004 many of the lessons found under Educational Resources were presented at The Bostonian Society Teaching Boston History Workshops: Boston in the Industrial Revolution, the Lowell Conferences on Women’s History, the Melrose, MA Summer Institute, the North England Regional Conferences for the Social Studies, and the Worcester Alliance for Education. 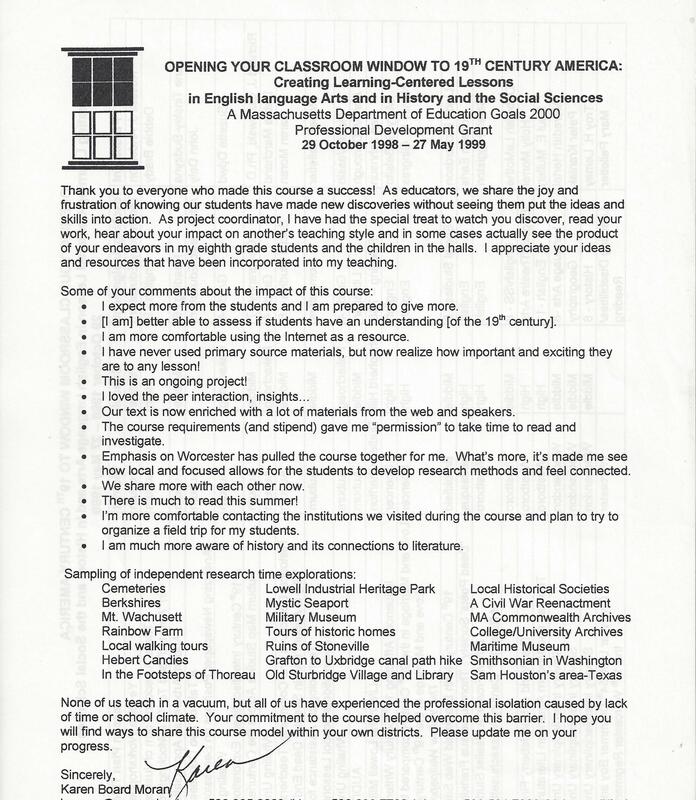 1998-1999 “Opening Your Classroom Window to 19th Century America”, a Massachusetts Department of Education Goals 2000 Professional Grant for Teachers. The course provided a unique balance of pedagogy, academic content and field trips into community resources. It not only lifted “the sash to open the window to the 19th century”, but mentally, emotionally and sometimes physically allowed participants “to climb through into another time” with our students. Complex thinking skills grew using an interdisciplinary focus including the art, literature, history, music, economics, architecture, government, geography and religion of the 19th century–an era of great change and contrasts that influence how we live today. It’s more that teaching about the Civil War! time to review the context of the materials participants would teach. time to explore community resources to enhance the teaching of local history. time to create, test and evaluate lessons. support and feedback from recognized leader in teaching and history. a $1000 stipend, supported in part by each district, that shows the teacher they are valued as a professional. 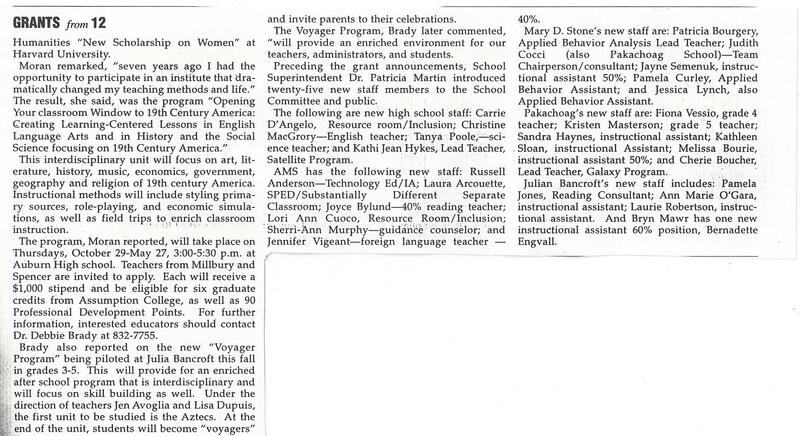 six graduate credits from Assumption College for $1000. 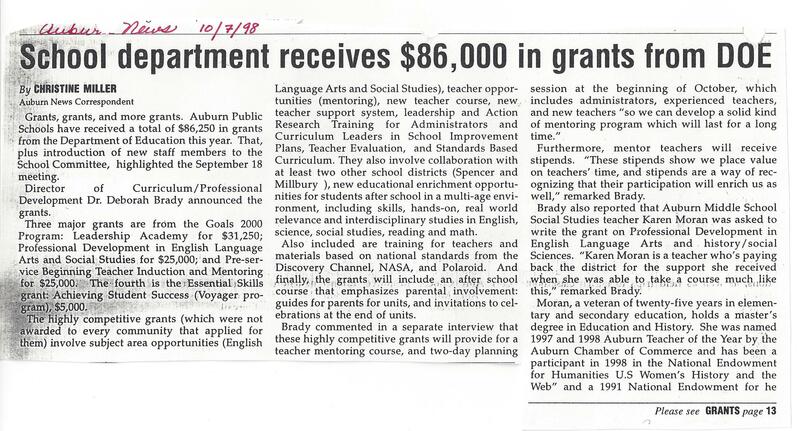 ninety Professional Development Points through Auburn Public Schools. Moran’s unit created for this grant was “Auburn, Massachusetts Women Enter the Public Sphere in 19th Century“. at the Alliance for Education on March 6. Their work is featured at this link. 2003 August 11-15 Classroom Paths to Impressionism Teacher Workshop, Worcester Art Museum, Worcester, MA. 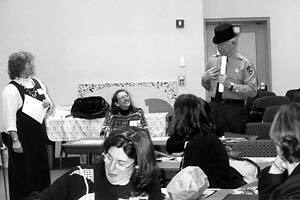 To prepare classroom teachers for the 5 October 2003 opening of “Paths to Impressionism” at the Worcester Art Museum a workshop was offered. This workshop explored the world that gave birth to the Impressionists. Classroom teachers immersed themselves in the social history, art, literature and environment of the Impressionists to share with their students. 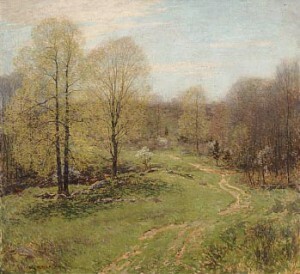 The institute balanced pedagogy and academic content under the mentorship of a practicing classroom teacher and academic experts who provided content-rich and learner-centered experiences aligned with the Massachusetts Curriculum Frameworks, such as an au plein air painting session and interactive gallery visits. Professional Development Points were given to teachers who created a specific lesson for their class by the end of the institute. A comprehensive research paper based on the student’s curiosity and interests was submitted to earn college credit. All participants received a copies of the lesson plans and research papers to help them incorporate art into their classrooms. Au plein air painting session with George Hancin, painter and educator in Institute Park. Connecting the Paths to your classroom: Sharing our classroom ideas. A final copy of the lesson must be sent to Karen by Monday, August 18. College credit papers must be sent to Karen by Monday, August 25. Sandrof, ivan. 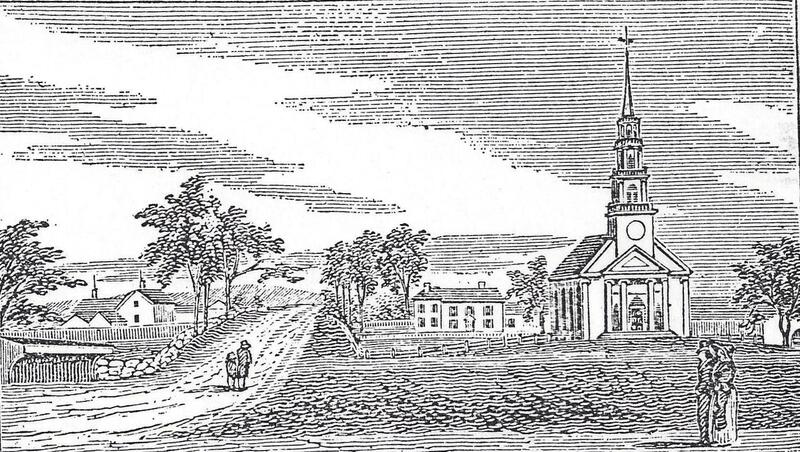 Massachusetts Towns: An 1840 View. Barre, MA: Barre Publishers,1965, 75. 2003 August 25-26 and October 14 Classroom Connections to Sutton 300, Sutton Public Schools, Sutton, MA. This “Teaching Through a Local Lens” workshop is a model of how to open your classroom curriculum to teach a variety of disciplines connecting educators to local resources. 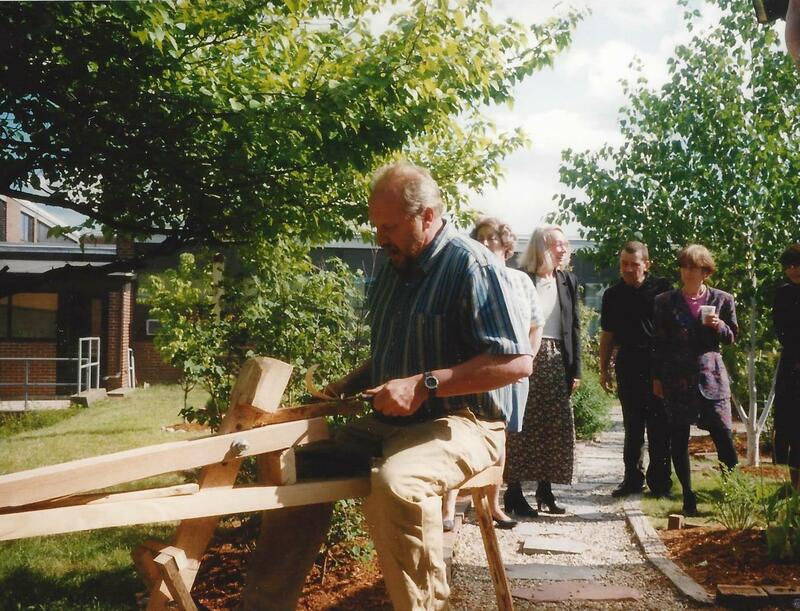 It was created to encourage students to be engaged in Sutton 300, a celebration of Sutton’s 300 year history throughout 2004. 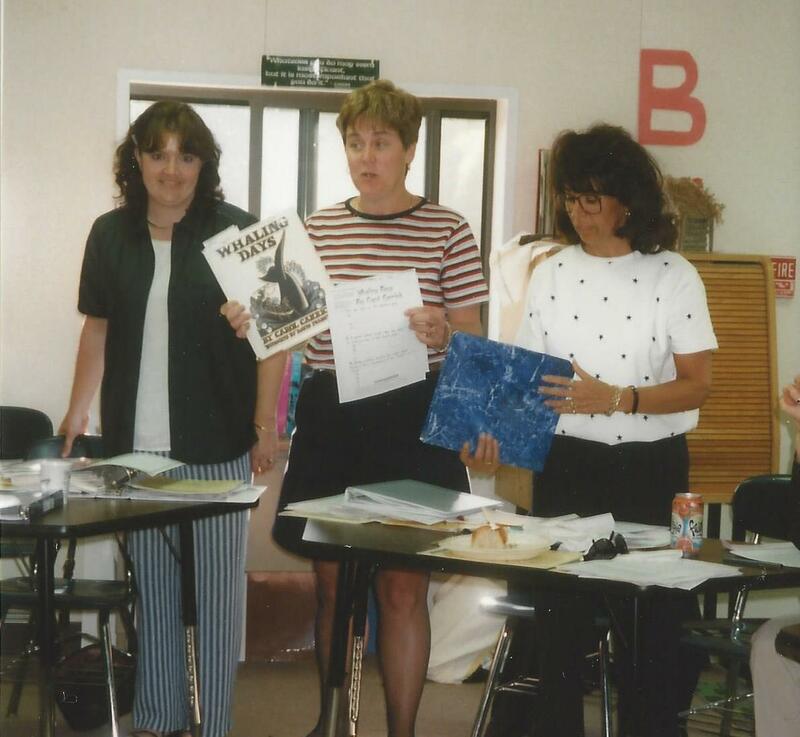 Teachers worked in teams or individually to shape their new found knowledge of the community into “Hands-on, Minds-on” lessons or units aligned to the Massachusetts Frameworks to be used within the Sutton Public Schools. History is not the only link between the 21st century and the local spirits. “Pick a Character”. Millbury-Sutton Chronicle, 3 January 2002 (12). The method the teacher chooses to engage their students’ minds and bodies depend on the instructor’s teaching style and comfort level, but it also requires a body of knowledge–content. Consider student role-playing, painting student designed murals, student written and produced plays or musicals, student field research and share their finds with the community, student created web site museum and stories, student created period newspapers, student gathered oral histories, hold a biography fair where students meet in character, student designed tour maps, take field trips, student created videos (broadcasts from the past), use primary resources in the classroom, student created timelines linking local to global events…the list is as long as our imagination allows! A personal favorite is having students research local historic characters and then meet each other in character at the local tavern for cider and cornbread. Additional Sutton resources connected with Lucy Waters Phelps. Blackstone River Watershed Association Map. 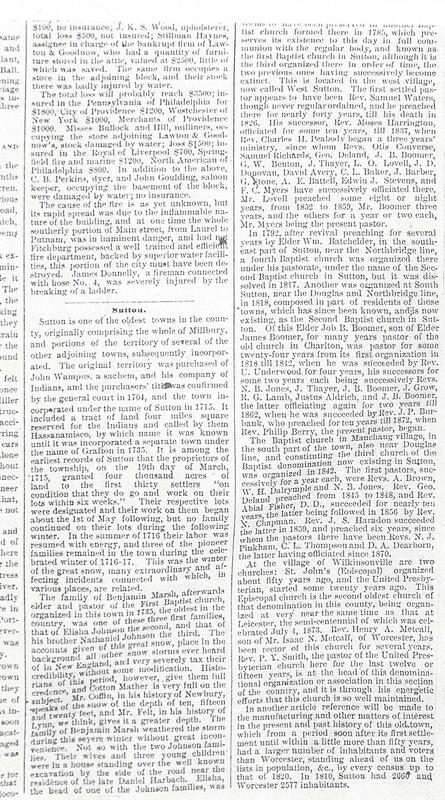 “Sutton”, Massachusetts Weekly Spy, 1874 February 13. Found at the American Antiquarian Society. 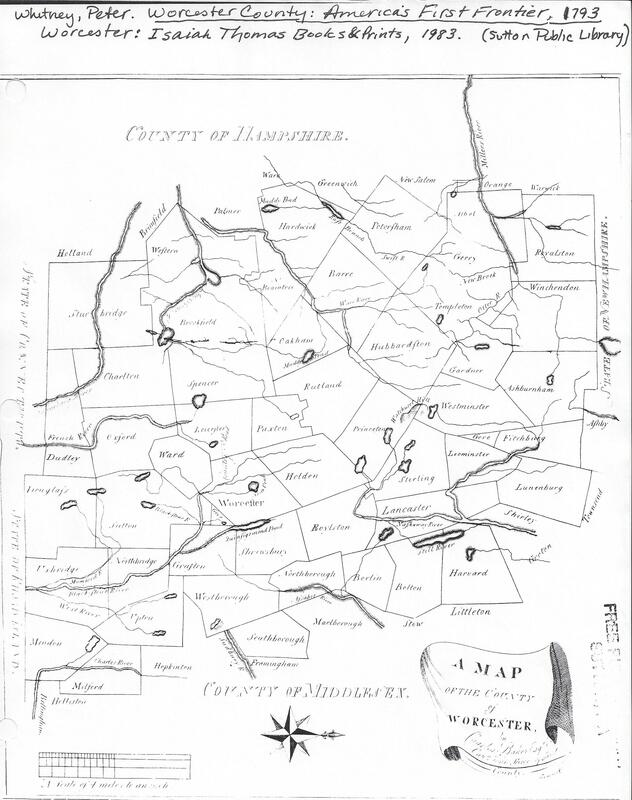 Sutton and surrounds map from Peter Whitney’s Worcester County: American’s First Frontier, 1793 Worcester: Isaiah Thomas Books & Prints, 1983. At Sutton Public Library. 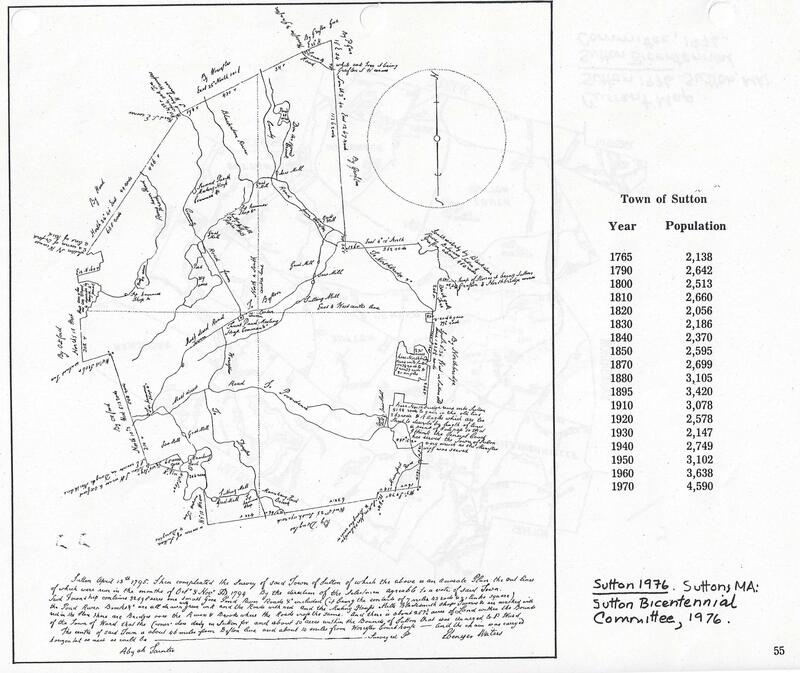 Sutton, MA 1795 Map. Sutton 1976. 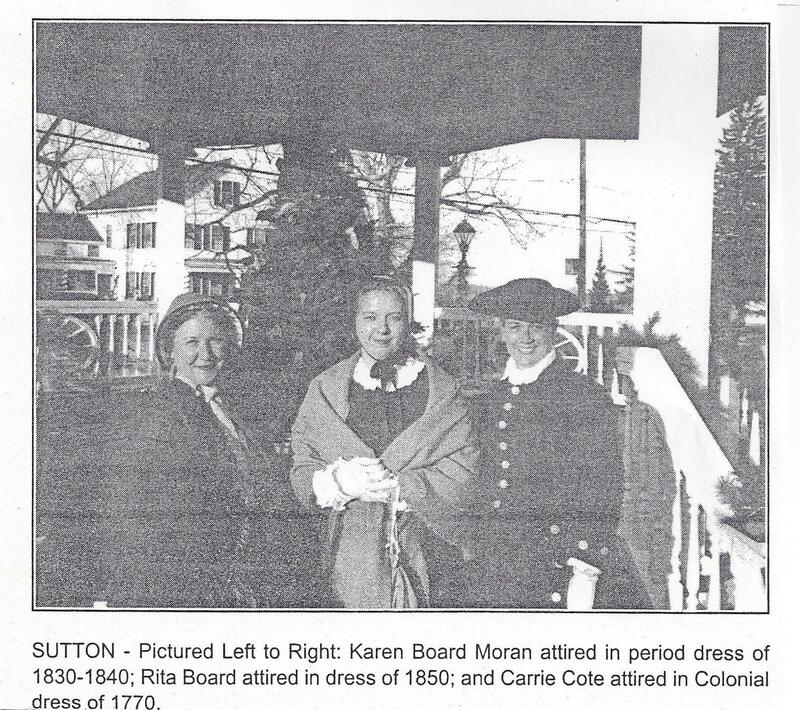 Sutton, MA: Sutton Bicentennial Committee, 1976. At Sutton Public Library. 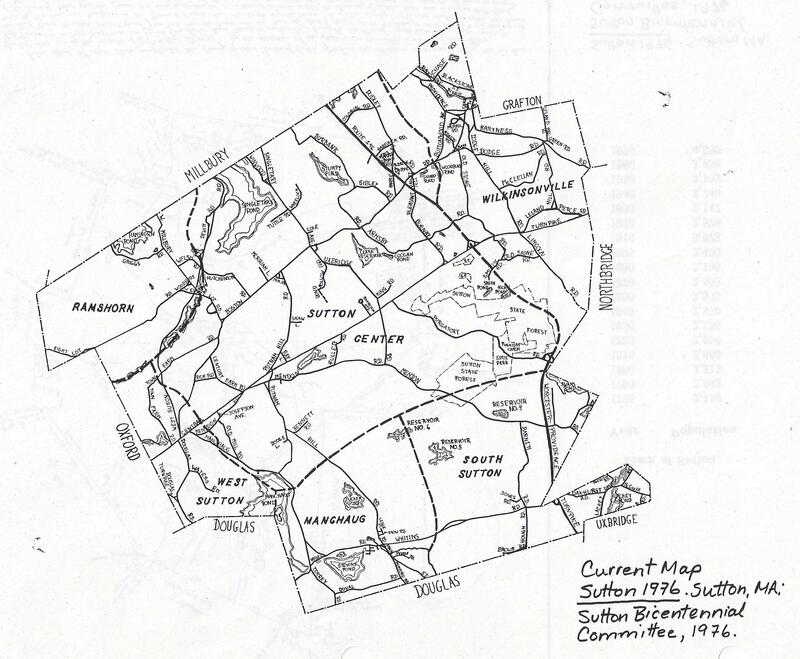 Sutton, MA 1976 Map. Sutton 1976. Sutton, MA: Sutton Bicentennial Committee, 1976. At Sutton Public Library. Sutton Spirits to research and reenact. 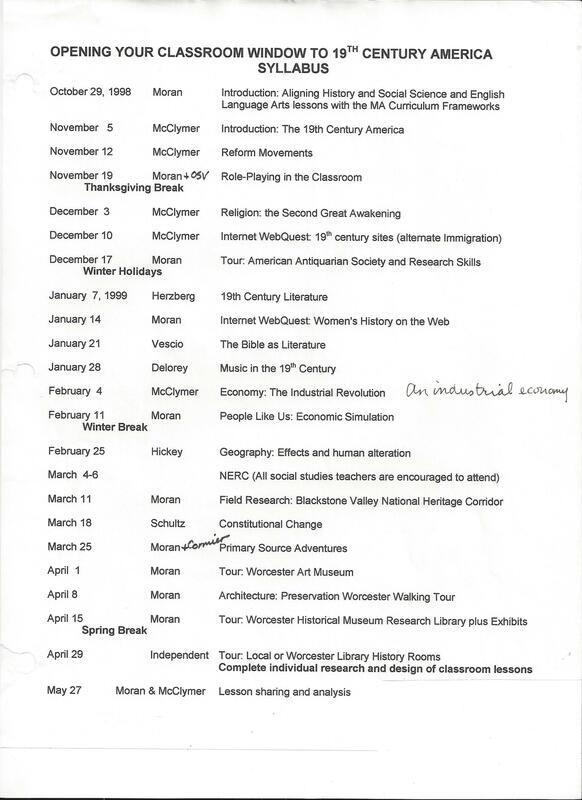 Compiled by Karen Board Moran, 2002. 5th grade “Doorways to Sutton 2004: A Celebration of our Local History” by Ann Junnila and student teacher Alana LeClaire. The focus is printmaking with Soft-Kut Lino involving history, art and architecture based on the doorways and facades of homes in Sutton Center and links to Isaiah Thomas and the first printing press . Thomas’ paper used to print the Massachusetts Spy was made at Crooked Pond (Lake Singletary) in Sutton, MA. 6th grade “Discovering How the Past Meets the Present in Sutton” by Hillary Ellingson, Pam Krygsman, Eileen Mitchell. Students will research a famous historical person and create a personal “historical journal of their discoveries before sharing their new knowledge in an oral report with a poster or PowerPoint presentation. 7th grade “Cooperative Learning Project: Creating a Sutton Historical Newspaper” by Lorraine Bachand, Barbara Chapulis. Newspapers will be created for 1700-1750, 1750-1800, 1800-1870, 1870-1930 after completing research. Students will also assume the identity of one of the historic characters in their research and perform a 5-7 minutes presentation. Costumes are encouraged. 8th grade “Narrative Based on the Blackstone River Unit” by Jeneen Moran, Steve Romasco. Students will write a paragraph a day for June 1-7, 1825 in their journals relating events of a typical week incorporating at least 10 facts they have learned about life in the Blackstone River Valley. The class will read two assigned chapters of Gerald Tesch’s Never the Same Again and share their summaries and illustrations. 8th grade “Pen & Ink Study of Sutton’s Local Historical Buildings Using Quill Pens” by Ann Junnila and student teacher Alana LeClaire.